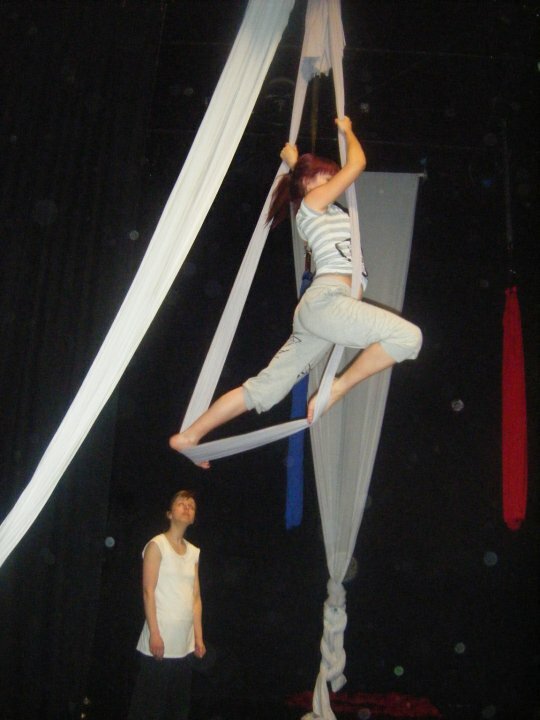 On Monday Fidget Feet gave a workshop on aerial dance in our venue in Stockwell Street. It turned out to be splendid and spectacular. All the participants were incredibly enthusiastic to be trying out acrobatic dances while climbing up and down fabric and swirling in cocoons. Take a look at the amazing pictures underneath. Did you know that we regularly organise workshops such as drawing classes, summer camps, theatre workshops … Interested? Just keep an eye on our website for the latest announcements. This entry was posted on May 26, 2010 at 10:28 am and is filed under Dance, Performance, Workshop. You can follow any responses to this entry through the RSS 2.0 feed. You can leave a response, or trackback from your own site.